If you’re a regular reader, you’ll probably know that I solved my acne woes by going on Roaccutane. I am however still left with some scarring and redness on my face from the years of angry spots. I’ve had countless consultations and the most frequent advice I’ve received is that they will only fade with either extremely expensive surgery or a lot of time and love to let it heal. To help things along, I’ve been advised by my dermatologist aka my saviour, to keep my skin moisturised at all times. As much as I have my favourite moisturisers that I keep going back to, I’m always on the hunt for anything that will help me speed things up. 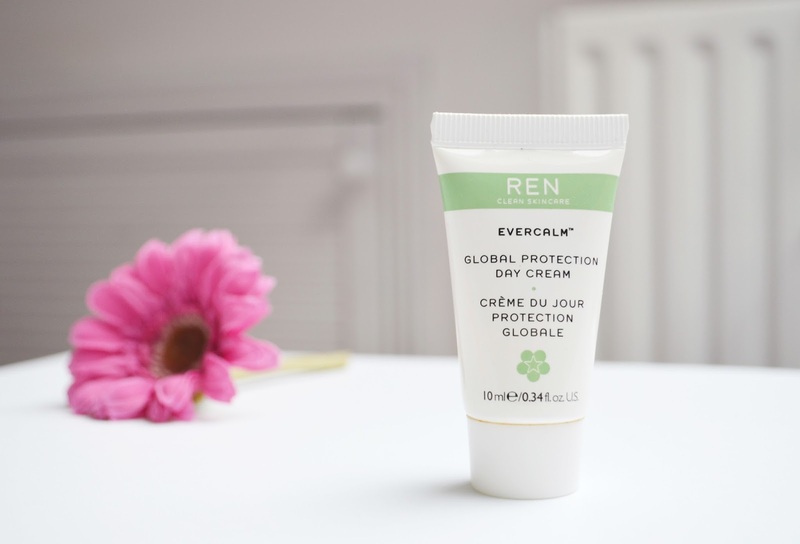 This month I was given a sample of REN’s Evercalm Global Protection Day Cream by a friend as it is specifically made to target those with sensitive skin. She had sworn that it helped her marks on her face so I was ready to give it a shot. The tube that I had was a small 10ml tester tube. Usually the day cream comes in clear pump bottle. Once again, I’m not a huge fan of products that come with a pump as there’s less control of how much comes out. I do like that the bottle is transparent though so you have an idea of how much is left. Luckily I had a tube so I was able to squeeze the living day lights out of it to get every little bit out. Waste not, want not! Now to the good stuff. The cream is more of a gel-like serum rather than a cream which to be honest I prefer in a moisturiser. Mostly because I feel as though serums sink into my skin a lot better than thick creams do.That being said, I did find that this cream was a slightly greasy. There was a residue that I could feel on my skin for a good 10 minutes before it had completely dried. Once it was all on, I could feel a cooling tingling sensation. Probably not as strong as Witch products but enough for me to feel my skin feeling almost refreshed. Most mornings my face is extremely red and it takes a while for my skin to settle down. I was finding that no sooner than I had put the Global protection day cream on my skin immediately felt better. It’s clear to see that the product isn’t too harsh and would be ideal for those with sensitive skin. By the end of the day, my skin was still moisturised and I didn’t feel the need to re-moisturise throughout the day, which I sometimes do. What I love most is that it is completely paraben-free, sulfate-free, synthetic fragrance-free, synthetic dye-free, petrochemical-free and phthalate-free. Sounds almost too good to be true right? I will say though that because it’s synthetic fragrance free, that doesn’t mean that there is no fragrance. In fact there is a smell to it that won’t sit well with everyone. I wasn’t sure I liked it too much but after just 6 days of use I could see that I would easily put up with the smell with the results that I was seeing. Honestly, I think that there are a lot of people out there that would benefit from this product. If you skin is dry, flaky and showing signs of redness then I would definitely give it a try. I’m going through an oily period at the moment so it was a little too greasy for my liking. Other than that minor issue, it’s a fab product that’s vegan and cruelty free. Amazing! What other REN products have you tried? Recommend something for me?